For information about Wikipedia's page protection policy, see Wikipedia:Protection policy. For other uses, see Protection (disambiguation). 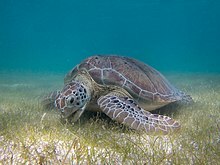 The shell of a sea turtle provides protection from predators. A suit of armor, crafted for a person and their mount to wear as protection from potential enemies. Safety equipment and supervisor instructions at a construction site to provide protection to workers. The image of a padlock superimposed over a circuit board pattern symbolizes internal protections in a computer system. 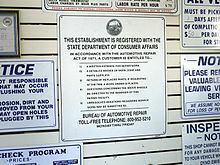 Consumer protection laws often mandate the posting of informative notices, such as this one which appears in all automotive repair shops in California. The meaning of the word 'protection', as used in the electrical industry, is no different to that in everyday use. People protect themselves against personal or financial loss by means of insurance and from injury or discomfort by the use of protective clothing. They further protect their property by the installation of security measures such as locks and/or alarms systems. Some kind of protection is a characteristic of all life, as living things have evolved at least some protective mechanisms to counter damaging environmental phenomena, such as ultraviolet light. Biological membranes such as bark on trees and skin on animals offer protection from various threats, with skin playing a key role in protecting organisms against pathogens and excessive water loss. Additional structures like scales and hair offer further protection from the elements and from predators, with some animals having features such as spines or camouflage serving exclusively as anti-predator adaptations. Many animals supplement the protection afforded by their physiology by burrowing or otherwise adopting habitats or behaviors that insulate them from potential sources of harm. Humans originally began wearing clothing and building shelters in prehistoric times for protection from the elements. Both humans and animals are also often concerned with the protection of others, with adult animals being particularly inclined to seek to protect their young from elements of nature and from predators. In the human sphere of activity, the concept of protection has been extended to nonliving objects, including technological systems such as computers, and to intangible things such as intellectual property, beliefs, and economic systems. Humans seek to protect locations of historical and cultural significance through historic preservation efforts, and are also concerned with protecting the environment from damage caused by human activity, and with protecting the Earth as a whole from potentially harmful objects from space. Fire protection, including passive fire protection measures such as physical firewalls and fireproofing, and active fire protection measures, such as fire sprinkler systems. Waterproofing, though application of surface layers that repel water. Protection of technological systems is often symbolized by use of a padlock icon, such as "🔒", or a padlock image. Protection mechanism, in computer science. In computer sciences the separation of protection and security is a design choice. William Wulf has identified protection as a mechanism and security as a policy. Consumer protection, laws governing sales and credit practices involving the public. Protectionism, an economic policy of protecting a country's market from competitors. Protection of rights, with respect to civil and political rights. Data protection through information privacy measures. ^ Brian Scaddan, 17th Edition IEE Wiring Regulations: Explained and Illustrated (2015), p. 41. ^ Emily Monosson, Evolution in a Toxic World: How Life Responds to Chemical Threats (2012), p. 18. ^ Proksch E, Brandner JM, Jensen JM (2008). "The skin: an indispensable barrier". Exp Dermatol. 17 (12): 1063–72. doi:10.1111/j.1600-0625.2008.00786.x. PMID 19043850. ^ Madison KC (2003). "Barrier function of the skin: "la raison d'être" of the epidermis" (PDF). J Invest Dermatol. 121 (2): 231–41. doi:10.1046/j.1523-1747.2003.12359.x. PMID 12880413. ^ Jaquetta Hawkes, The Atlas of Early Man: The Rise of Man Across the Globe, From 35,000 B.C to A.D. 500 (1993), p. 21. ^ Wulf, W.; E. Cohen; W. Corwin; A. Jones; R. Levin; C. Pierson; F. Pollack (June 1974). "HYDRA: the kernel of a multiprocessor operating system" (PDF). Communications of the ACM. 17 (6): 337–345. doi:10.1145/355616.364017. ISSN 0001-0782. Look up protection or protect in Wiktionary, the free dictionary.